It is a mitzvah to have a festive meal on Purim (Ramah 695:1). It is during this meal that one experiences the most profound growth and escalation in our connection to HaKadosh Baruch Hu. This meal should include meat and wine. One should also wash on bread at this festive meal because there are many authorities who hold that it is an obligation (Raavya Vol. II Siman 563). By the same token, it is preferable to have beef during this meal and not just chicken, as there are some authorities who hold that chicken does not fulfill the requirement of simcha. AT LEAST TWO ITEMS – The meal should have at least two items, meat and some other dish (See Rambam 2:15 who learns that the obligation of Mishloach Manos stems from the obligation of the Seudah). This is at a minimum. Indeed, the Rambam indicates that one should arrange and organize the best meal that one can (Megillah 2:15). DURING THE DAY – This meal is held during the day. If one holds it at night, he has failed to fulfill his obligation. Nevertheless, one’s evening meal should be more festive than usual. One should wear clothing befitting a festival, and rejoice. OTHER MINHAGIM – There is also a custom to eat a kreplach at the Seudah, which is meat covered with a dough. This is because the entire holiday came about through hidden means (Likutei Maharich). Since Purim is 30 days before Pesach – there is a custom to start learning some of the halachos of Pesach at the Seudah. Some have the custom to eat Hamantaschen at the meal (Taamei HaMinhagim, Aruch HaShulchan and perhaps the Kitzur Shulchan Aruch). Daniel? This is Purim – about Esther, not Daniel! Also, the Gemorah (Megillah 13a) tells us that Esther also ate seeds when she first came to the palace – Haigai fed it to her. Why then does the Ramah only quote Daniel? Also, the Mishna Brurah mentions the Gemorah too, but does not address the question of the Pri Chadash and the Aruch haShulchan. This author would like to propose the following answer. Esther knew that there was rhyme and reason to her being taken into the palace. She knew that she was in need of a miracle. And now, those in charge of the women who were brought to the palace were offering them anything. She could have had her choice of any kosher food. Why then did she pick seeds? Esther most certainly was aware of the miracle that happened to Daniel and his friends in the very beginning of Sefer Daniel. After ten days they were healthier and finer than all the others solely on a diet of seeds. This was the beginning of the help that Daniel rendered to his people. Perhaps she should take the same avenue. With this answer we have greater insight into the minhag of eating poppy seed hamantaschen. Just as there was a miracle that occurred to Klal Yisroel regarding the seeds that Daniel and his friends ate, wherein they adhered strictly to the Kosher dietary laws through seeds and just like Esther tried to follow in those footsteps, so too should we merit miracles by virtue of our adhering carefully to the Torah’s dietary laws as symbolized by the poppy seeds. There is another message about Purim that everyone could gain from. Daniel merited a miracle by keeping kosher. Esther did too. This is the reason behind our custom of eating poppy hamantaschen. 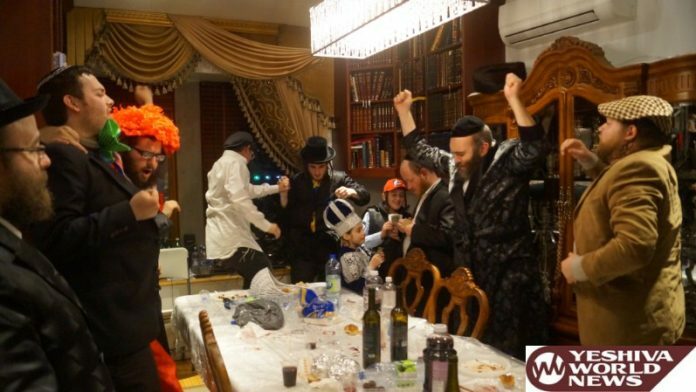 The main Purim meal is held Purim afternoon and is preceded by Minchah. The meal is extended into the night. Most of the meal, however, should be during the day.